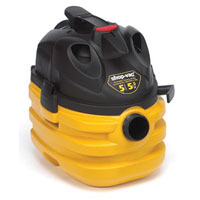 A solidly built wet/dry vacuum with a durable plastic drum, the Shop-Vac 587-24-62 has a 5-gallon tank and 4.10 kW motor. This Shop-Vac doesn’t disappoint performance-wise, offering a strong suction power. The design also allows you to pick up and carry the lightweight vacuum without straining your back. One benefit we noticed with the accessories is the sixteen-inch crevice tool, which reaches narrow spaces, such as those in your car. For a good performer that runs smoothly and quietly, this Shop-Vac model doesn’t disappoint.